The NEW Crawler Short Arm Systems are the result of continuous improvements done by Rancho® to give you the best possible on and off-road experience for your JL Wrangler. 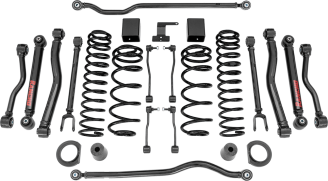 These kits include corner specific progressive rate coil springs and fully adjustable control arms with D2 bushings to give you improved comfort, durability and worry free operation. They also feature our NEW heavy-duty front and rear adjustable track bars with D2 bushings to center the axles. The D2 bushings found in our control arms and track bars feature PTFE for grease-free operation allowing the sleeve to rotate in the bushing without resistance reducing wear. Precise adjustments can be made while it’s still installed on the vehicle. 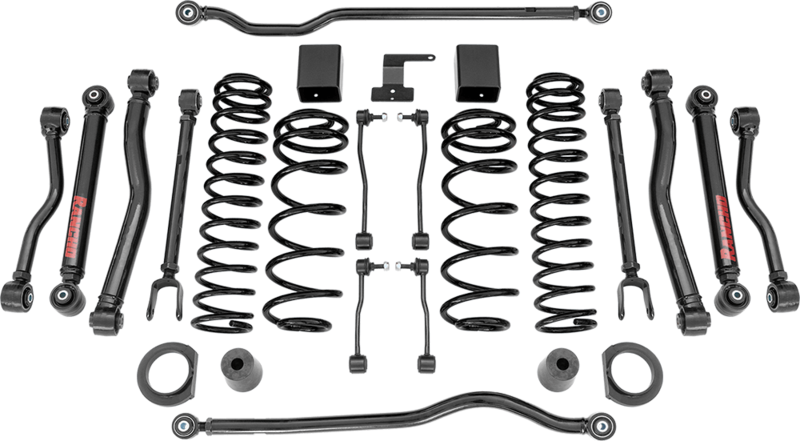 Pair with the Rancho JL-specific shocks that feature our Dynamic Rebound Spring (DRS) Technology. This DRS Technology features a precisely tuned metal spring that provides additional control, reduces body roll, and prevents overextension. Aftermarket driveshaft is required for this kit to achieve maximum front axle articulation. The Rancho brand offers a Limited Lifetime Warranty** for these Suspension Systems.